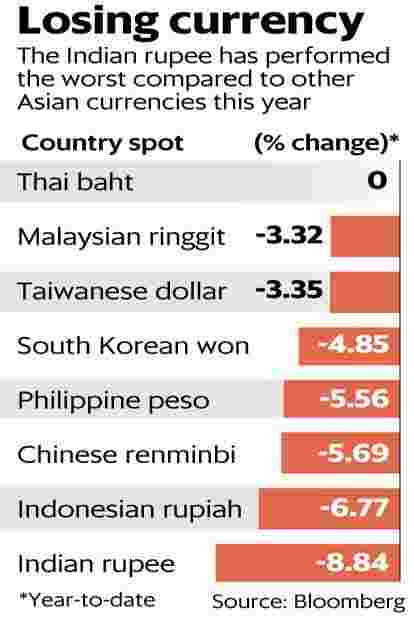 Asia’s worst performing currency in 2018 is expected to redeem itself next year, considering that global factors may be more conducive to a stronger Indian rupee. Indeed, there are already signs of this in recent weeks. The biggest positive is the drop in oil prices. Thanks to falling crude prices, India’s import bill need not hurt its economy and any shortfall can be more than handled by the Reserve Bank of India’s (RBI) forex reserve stockpile. Besides, the country’s current account deficit is expected to be slightly lower at 2.5% of gross domestic product (GDP) for FY19, as against earlier expectations of 2.9% of GDP. A strong balance of payments in times of adverse investor sentiment towards emerging markets gives the much needed cushion to the exchange rate. Indeed, the fate of the rupee has changed largely because of oil. Global oil prices have been dropping almost every day and the Indian basket is down sharply as well. With crude prices down more than 30% from a year before, a net importer like India benefits greatly. “The price of crude oil remains a key driver of INR. Its sharp fall and our view that demand/supply factors will keep prices contained should be INR supportive," said Nomura Securities in a note. Adding to the sentiment is the latest US Federal Reserve policy stance, which indicated gradual tightening. Expectations of three more rate hikes in the US in 2019 are now being pruned. Domestic economic growth is also looking up, which should give confidence to foreign investors to put money into Indian assets. But not all analysts share the optimism. Data from Bloomberg shows the average forecasts of top ten analysts puts rupee at 71.45 to a dollar by March and at 71 by the year-end. There are also a host of risks that can prevent the rupee from notching big gains. In 2018, investors pulled out over $7 billion from local bond markets and there are no signs that big flows may return, considering 2019 is an election year. Nomura noted that general elections are a key risk. The other risk is the inability of banks to lend to the economy due to capital constraints and non-bank lenders’ inability to lend due to the liquidity crunch. Needless to say, the movement in US yields and the performance of the US economy will also have a large bearing on the rupee.